roviding high end outdoor adventures along the Snake River, Jackson Hole Vintage Adventures preserves the magic of a bygone era. In the Summer, we provide float trips down the Snake River in vintage wooden boats. Come Winter, we switch gears and provide vintage sleigh rides and snowshoe tours. The hub for all of our tours is our Snake River-side Tipi Camp. We took the morning float and it was great. Perfect scenery and watching the eagles was amazing. Fantastic morning brunch when we got to AJ’s camp. Would highly recommmend. ur Riverside Tipi Camp is the destination of both our Summer and Winter Adventures. This comfortable camp is well appointed to afford a cool, shady space in the summer and a warm, cozy retreat in the winter. Located in a Cottonwood forest along the banks of the Snake River, it’s what helps us create life long memories for our guests. The kitchen at camp provides delicious meals to further enhance ours guests’ adventure. After pushing off into the river, your guide serves hot beverages and warm blankets. For the next few hours we will enjoy wildlife viewing, along with the sights and sounds of the river. When we arrive at Tipi Camp, a wonderful Brunch is waiting in the dining area, the entire Teton Range in view. Customers of Jackson Hole’s many great restaurants expect a four course gourmet dinner prepared by accomplished chefs, served on white linen by an exceptional wait staff. 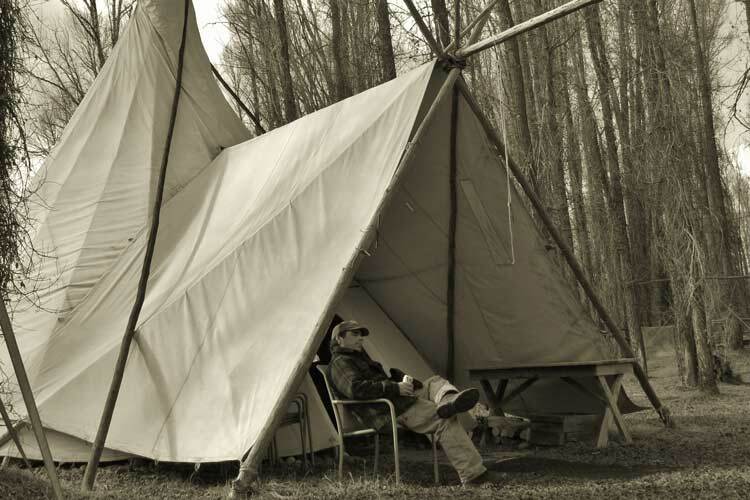 Our Riverside Tipi Camp now offers that fine dining experience. A late afternoon departure provides us with privacy and tranquility as we enjoy the river’s magical beauty.